The Nobel 1.0A ($2,000), an enhanced version of an earlier Nobel model, features an X/Y-axis print resolution of 300 microns and a Z-axis resolution of 25 microns. A company that caters to the STEAM markets announced multiple 3D printer models, including one that sells for under $230. XYZprinting, owned by a Taiwan-based OEM manufacturer, introduced its new products during CES 2017 in Las Vegas. The da Vinci Nano, the $230 model, is intended for first-time users. It includes a one-button printing process and produces objects about 4.7 cubic inches in plastic PLA in an enclosed printing area. The device itself is about 12 cubic inches in size. The company said the printer would be available sometime during the second quarter. The company already offers a sub-$250 3D printer, the da Vinci miniMaker, with auto-calibration and auto-loading filament, launched in 2016. A slightly pricier da Vinci Mini ($289) uses WiFi, whereas the miniMaker has a USB port. Both have a build volume of about 5.9 cubic inches. The da Vinci Junior 2.0 Mix, a $450 3D printer that can blend two PLA filaments. The printer uses a dual-feed with one extruder to create a print that gradually changes color. Two modes — multicolor and mixer — allow users to experiment with different filament colors. According to an unboxing video on YouTube, the model is currently being beta-tested. The Nobel 1.0A ($2,000) offers more precision in printing. This enhanced version of an earlier Nobel model features an X/Y-axis print resolution of 300 microns and a Z-axis resolution of 25 microns. It handles a maximum print area of 5-inches by 5-inches by 7.9-inches. The priciest launch is the Nobel Superfine ($2,700), which is the most precise model in the XYZprinting line, intended for creating "jewelry or prototypes," according to the company. The machine uses a direct light processing (DLP) projector to cure a photosensitive resin, which can accommodate a print resolution of 25 microns. This model will also be available sometime during the second quarter. In the third quarter of 2017, the company expects to introduce the da Vinci Super, with an 11.8 cubic inch build plate. That will be priced at $2,000. 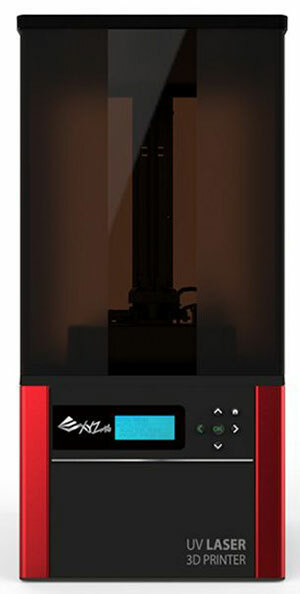 The following quarter will see the arrival of the 3D JET and 3PP0A, commercial-grade printers for prototyping. The latter will be the company's first composite powder, binder jetting 3D printer.